Use TB2QA78 to reference this item. 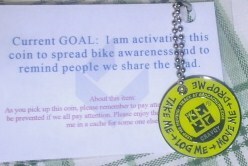 I am activating this coin to spread bike awareness and to remind people we share the road. This is a message to let you know that your trackable item TB2QA78 has been marked ‘missing’ by a cache owner or a site administrator. Trackable items are marked missing when it is determined that they are no longer located in the cache they are listed in or in the hands of the current holder. Please review the most recent logs on your trackable item to learn more information about its current state. Did not see today in Der Edelweiss Reisekerbtier Ferienort. Hopefully it will be found to travel again. Was out with Fog and he let me rescue this one. I will take back to WA State with me in about 3 weeks when I go on R and R. I think it's been trapped here long enough! Saw this one at the MAGC Foward Event. Thanks for sharing. Grabbing to drop it into our Event. Discovered this coin while logging it into the "Support The Geocaching Troops Mission"